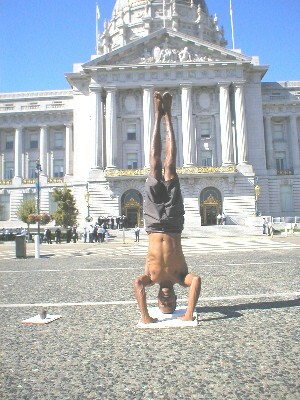 On 08 October, 2006, I continued with my intention of teaching free yoga classes on the lawn of San Franciso's City Hall. And, a most wonderful day it was .. ..
At 10:00am. May and I began the Surya Namaskar A Yoga Sequence. We then proceed to find repose in Virabhadrasana I. Followed by Virabhadrasana II. And then, Parsvokanasana. Soon later, a rather large man approached me. He asked me, "do you mind if I join in? I smiled. Laughed. Looked at May. And told him, "sit down." I asked him, "do you have any challeges or ailments that I should be aware of?" He told me, "I have chronic lumbar pain. I'm on methadone, vicodin, morphine, and today, I started taking ibuprofen." I refocused the yoga sequence to accomidate lower lumbar pain. Our new yogi then stood up. And told me, "you are a gift from god. I feel better already." He then began to walk through the park. Tet five minutes later, he returned and asked for a flyer. He stated, "I want to take one of your flyers to my group meeting." What more could a teacher ask then to have the possibility to help someome work through their pain. A wonderful day it was. I've always wanted to start practising yoga and maybe this is my chance.I'll take one friend with me and we're going to see how good is the yoga. This is so inspiring! I am a Yoga Practitioner but not at a level where I can teach yet. But I will remember this always. If you ever practice in the DC area (outside White House) I would join you and I can assure you of getting a group together. O yeah i love yoga and always want to start practicing but most of time i got busy in my studies. studies makes me busy and prevent me little joining any yoga group but now i make my mind to do this along with my studies. Thanks for making up my mind. This is very exciting. but in reality it is very difficult to take out time for such activity. We have reviews of all the most popular diet plans and coupons to help you get started on your journey to improving your health and vitality. This article gives the light in which we can observe the reality. This is very nice one and gives in-depth information. The gap between NSQ and Stacy was less than six seconds. Way too close for comfort, but she'll take it. Ironically, after some horrific displays in the past, the margin of victory today may have come from NSQ's relatively speedy transitions. We have now burned her sock collection. I wish I would find a free yoga class in my town. That would be just great! studies makes me busy and prevent me little joining any yoga group but now i make my mind to do this along with my studies. But I was sadly mistaken when I read your article. I tried yoga and the results for that certain moment were impressive. I can't wait to start my training into the art of yoga. To tell you frankly, I could get anything out of this blog.